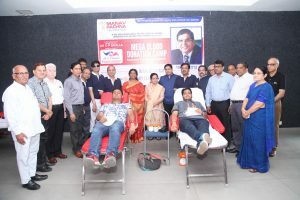 The entire Manav Rachna family paid homage to its Founder Visionary Dr. O. P Bhalla on his fifth death anniversary (September 16) through a Mega Blood Donation Camp at the Manav Rachna Educational Institutions (MREI) campus. The Camp, inaugurated by Dr. G. Anupama (IAS) Commissioner, Faridabad Division was organized under the aegis of Dr. O P Bhalla Foundation in association with the Lions Club of Faridabad; Rotary Club of Faridabad; B K Hospital, SantonKaGurudwara andSamanvayaParivar Trust. 1220 units of blood were collected during the camp. The Mega Blood Donation camp while perpetuating Dr O.P.Bhalla’s core belief of giving back to society, was also a reflection of the generosity of spirit evident among the young members of the Manav Rachna family, as they volunteered, most willingly to donate blood and help save lives. It is noteworthy that MREI has been organizing a series of camps for the benefit of the community during the month of September. These included free eye check-up camps, ergonomic assessment camps, and nutrition as well as physiotherapy camps. Smt. 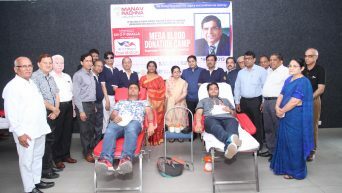 Satya Bhalla, Chief Patron, MREI echoed similar sentiments, greatly touched by the enthusiasm at the Blood Donation camp. Among the other dignitaries present on the occasion were Dr. Amit Bhalla, Vice President, MREI; Dr. M MKathuria, Trustee; Dr. N.C. Wadhwa, Vice Chancellor, MRIIRS; Dr. Sanjay Srivastava, Vice Chancellor, MRU; among others. A bone marrow donor registry drive was also organized in association with Jeevandayini Social Foundation, in technical collaboration with Gene Bandhu Blood Stem Cell Donor Registry. 35 donors registered for the Bone Marrow/Stem Cell donor registry drive.